The S-EVAP KD combines standard KD evaporation procedures with our unique rotary water bath and manifold, increasing sample throughput and bench space. The S-EVAP-KD comes in 5, 8, and 10 position models. 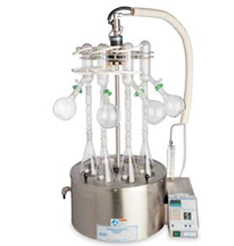 Organomation’s S-EVAP solvent evaporators have a broad range of applications including oil and grease analysis using Freon and other approved solvents, concentrating extracted materials from Soxhlet operations, and other KD evaporation methods. At each sample position, the KD flask rests on the bath cover disk and the concentrator tube sits partially submerged in the deep water bath below the cover disk. The solvent boils from the flask and through the Snyder column. The solvent vapour then cools in the condenser which is attached to a centrally located water manifold. The glassware is held in place with quick disconnect fittings which allow for easy retrieval of samples. The solvent leaves the condenser through a specially designed sidearm into either an individual collection flask or a centrally located solvent collection vessel. Solvent recovery through individual or central collection options reduces laboratory emissions and increases laboratory and environmental safety. The S-EVAP-KD comes standard with Organomation’s reduced height glassware so that the instrument can fit into a standard fume hood.